Welcome to Stampin' Sisters in Christ, where our challenges are inspired by scripture. Scripture: Matthew 6:25-34 ".... Behold the fowls of the air: for they sow not, neither do they reap, nor gather into barns; yet your heavenly Father feedeth them. Are ye not much better than they?...." 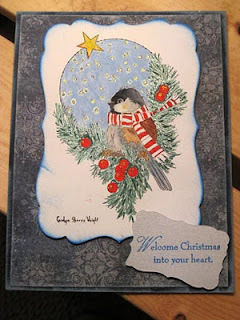 Challenge: Make a card/project that features a bird, such as in the patterned paper, a stamped image, a charm, etc. yes I did the coloring ...trying to get better at it ...could use lessons ...hint hint hint. Well good evening to all ....I wanted to share ...on the weekend we watched this Christmas show called Cancelling Christmas....first time I have ever seen this one. This show was different in the message it was trying to share ...ususally it has Santa listening to want kids want....but in this show ...Santa was asking them what they could give... now most of them said I don't have any money ...and this Santa said ....it does not take money to give ....it comes from the heart. One little girl he said ....you could give to your mom help with dishes ....just helping her ... he was trying to show them giving comes from the heart ...not from the almighty dollar. If we can give from the heart ...forgiveness....love ...understanding...all the money in the world will really not make you happy. You don't give because you have to ...because that is who and where your heart is ...sometimes in trying to give the very best of your self you screw up ...but you hope that those that say they love you and I do mean love you from the heart ....will understand ...and still will give from the heart. I know every year I am asked what I want for Christmas ...and every year I really can't answer in things or material things..what I want the most is health for all ...for the love of family and friends. To be just accepted . Things that can not be bought...they are given from the heart. You will get it!!! But really you did great. Congrats on your win and it was nice to post the SIC with you - I love you. Great card Mom! You did a fabulous hob with you coloring. You are to hard on yourself. A few post backs you did popcorn the bear and you did an amazing job. OK I am obviously loosing it because I missed this blog post totally. Congratulations on your win over at Pizzazz Aplenty. Your card is wonderful, and you did a great job on the colouring, it looks like you pulled the sample image right off the stamp block.